When President Franklin Roosevelt gave a C-47 (DC-3) to the Kingdom of Saudi Arabia in 1945, TWA was selected to provide management assistance to the newly formed Saudi Arabian Airlines, later known as Saudia. Over the years, our airline helped to build it into a proud flag carrier, providing training and personnel, especially in the areas of maintenance and flight operations. Thousands of TWAers completed temporary duty assignments, mainly at the Jeddah base. In 1975, Saudia began receiving its first widebody jets, Lockheed L-1011s. The airline requested help in training cabin crews that would include an In Flight Supervisor (IFS), to be modeled after our DCS position. To make this happen, six TWA DCSs were recruited for 6-month assignments that included training the initial Saudia crews at Breech Academy, visiting the Lockheed factory at Palmdale, California plus hands-on instruction at the Jeddah base and on-board L-1011 flights. 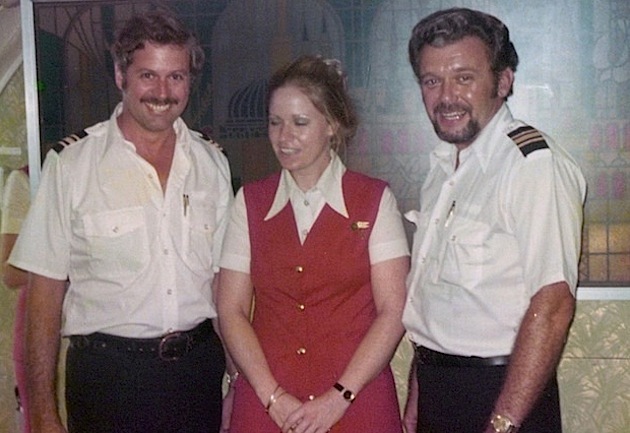 Tasked with sitting up on-board service procedures, safety qualifications and other facets of the job, these men completed their assignments in December 1975. Pictured with Saudia employees and Breech instructors, Bruce Megenhardt, Bob Henderson and Frank Messina are in the top row, left. Other non-DCS TWAers included Robert Randell, Bob Estrada and Gerard Miston. Above: Check-in at Saudia's London-Heathrow ticket counter; carry-on luggage was even more challenging. Below: Saudia's Jeddah headquarters building. ginger ale in a Jeddah hotel room. 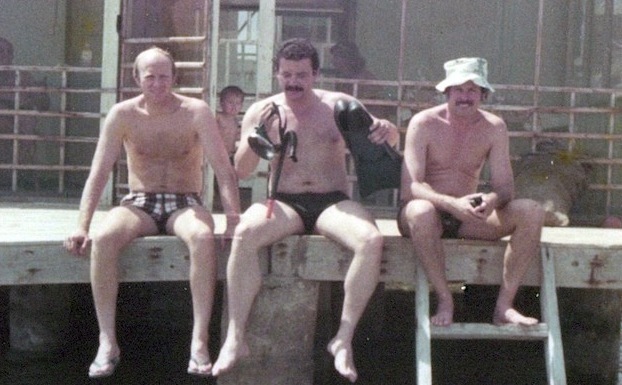 Tom Fitzgerald, Bob Henderson, Dale Kreimer and Tim Taylor at Karachi. In-cabin pet regulations were a bit different on Saudia. Falcon hunting brought passengers to Saudia, complete with falcons! while Larry Smith, below, enjoys the moment. Bob Henderson, on the L-2 door jumpseat. Clive Miller and Larry Smith. 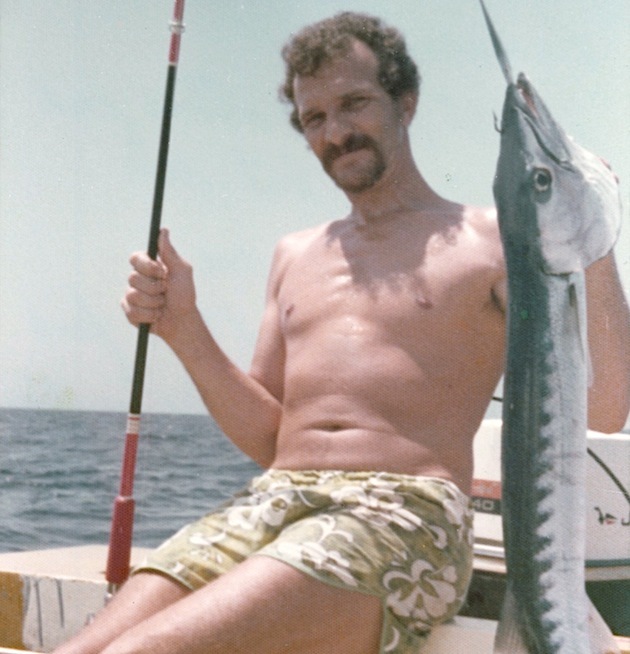 get ready for some scuba-diving, while John Izzo, below, displays a 15-lb. barracuda he pulled from the Red Sea. Tim Taylor and Frank Messina posing on an abandoned Jeep in Jeddah. "Golf-Hotel" (OD-AGH), is readied for departure at Riyadh. Jetways were yet to come at Kingdom airports. 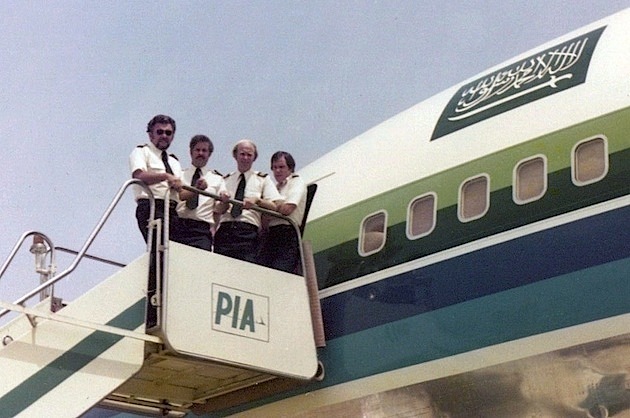 As Saudia continued expanding, two Boeing 747s were leased from Middle East Airlines (MEA) from June 1977, to be staffed with MEA pilots and a basic MEA cabin crew, plus a Jeddah-based Saudi purser and two Saudia hostesses from the newly opened London base. 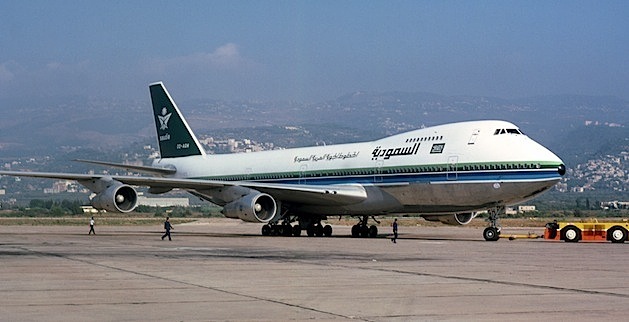 The 747s were flown over just a few routes: London-Riyadh, Riyadh-Cairo-Jeddah and a once-weekly Riyadh-Beirut roundtrip. Karachi was added later. Patterns were typically five and eight days duration, In addition, charters were carried out to transport school teachers between the Kingdom and Egypt. During the winter months, London-Riyadh flights stopped at either Geneva or Rome. 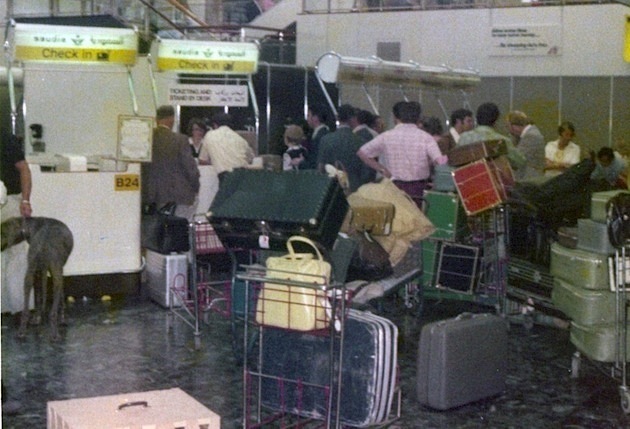 Annual Hajj charters were not assigned to the jumbos although pilgrim groups were carried on some of the 747 flights. Below: Don Hubbard (center) enjoys a laugh or two with Frank and Svein. 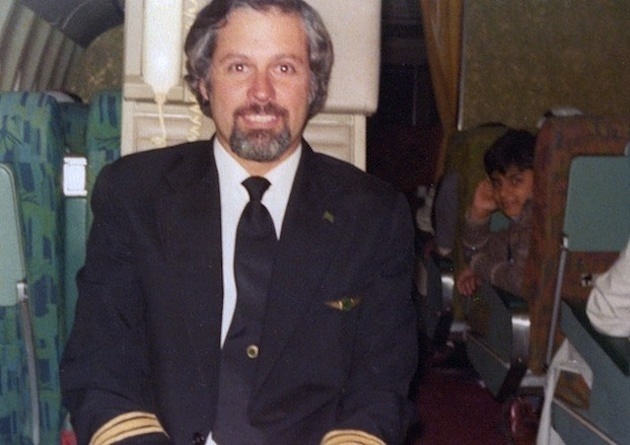 Jon Proctor at Cairo with MEA crew members Michel Khalifeh and his wife Hadia. Golf-Hotel is towed to the gate at Beirut for its return flight to Riyadh. Saudia eventually completed its program to train Saudi nationals as In Flight Sueprvisors and the TWA DCS assignments came to an end. All who participated agreed that the experience was unique, and most definitely a character builder! At the September 16-17, 2011 DCS Alumni Association reunion in Denver, members who served with Saudia posed for photos. 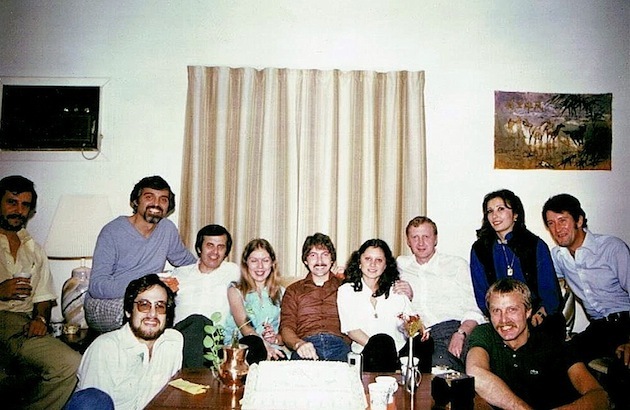 The London group is joined by two of the Saudia Six, Bob Henderson (far left) and Dale Kreimer (fourth from left).